This recipe is originally from Taste of Home, where its creator says she modeled it after her favorite pie from a “local coffee shop” which based most other Google references, including the Bakers Square web site, is Bakers Square. People must really love this pie, because the recipe is everywhere. I can see why it’s so popular. It’s attractive, very lemony and easy…..maybe even fool proof. I didn’t read the directions very thoroughly and interpretted “two packages of cream cheese” as two 8 ounce packages even though the recipe clearly states one 8 oz package and one 3 oz package. So I used 5 extra ounces of cream cheese and still had a good pie. Or at least Todd thought so. By the way, I cut this pie about 3 hours after chilling. The recipe says to chill overnight. So you can serve this pie after three hours, but it might look like this! I’m not sure what happened to the whipped topping border. It drooped like crazy, which is unusual for Cool Whip. Combine 3/4 cup of the sugar, cornstarch and salt in a medium saucepan. Add water and whisk until smooth. Place over medium heat and cook, whisking almost constantly, until mixture begins to boil. Add remaining 1/2 cup granulated sugar and reduce heat. Cook and whisk for 2 minutes or until mixture thickens and boils. Remove from heat and whisk in butter, lemon zest and lemon juice. Let cool for one hour. Prepare filling: Beat together 11 ounces cream cheese, powdered sugar and lemon juice. Fold in half of the whipped topping. Spread over bottom of baked pie shell. Spread lemon mixture over cream cheese mixture. Put remaining whipped topping in a freezer bag, snip of the corner and pipe dollops around the perimeter of the pie plate. Lemon flavor was wonderful. I’ve been baking/cooking since the age of ten. 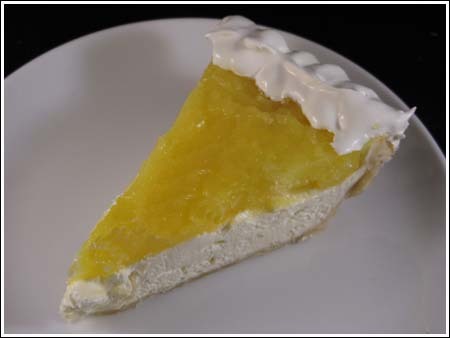 I made a couple of adjustments to the lemon layer as with a lemon meringue pie I aded egg yolks the second time around. The yolks made the filling a lot firmer. Great result. Ha! Glad you made it work, Dru. I need to make this pie again soon. It’s been a while. My fav. I made this delicious, scrumptious,beautiful pie. L did make a.mistake . I put the cream on top and that push the gel out. I just put in 2 wine glasses and ate as a desert with no crust. Still good. I will make it right next time. I will make it again and again. My kids love it also. this is like the copycat marie callendars pie too! yum! I finally got around to making this pie over the weekend and it was delicious! Definately a keeper! Yum! Thanks so much! Thanks so much for the comment! I am glad you liked the pie. One of these days, I am going to have metric weights for all the recipes. since I discovered your blog, I come here every morning. I made few of your recipes and they were all a smash-hit in my family! I do have problem with mesaures (since I am from Croatia and we have metric system) but I manage. I have awarded you the Blogging with a purpose award. I love anything lemon flavored…this looks and sounds heavenly.